Here was my Friday. It was crazy raining and the kids had the day off from school so what did I do? 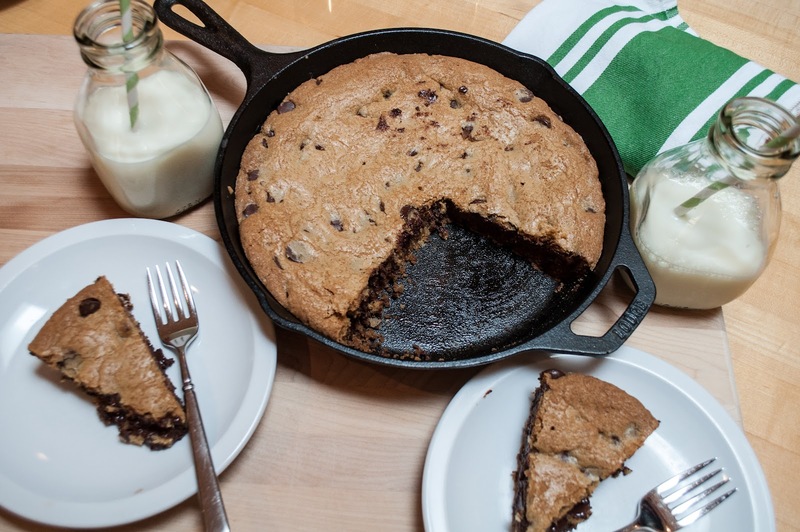 I baked 3; count them 3 things in my cast iron skillet. I was cast iron crazy! I started off the morning making the kids a big dutch baby (recipe soon) via the skillet. I did not of course eat this, I had a bite, teeny tiny. I am a creature of habit in the morning. I either have a big bowl of grapenuts topped with cafe fanny granola and some fiber one or a big bowl of oatmeal. I also always have to have at least 2 cups of Peets coffee, the stronger the better. I proudly admit it; I am a carb girl in the morning and always have been. Protein alone does not work for me. So my kids happily ate the big dutch baby for breakfast along with some eggs for protein. For lunch I prepared them my sausage & arugula skillet pizza, (sans the arugula as it was just for them). They happily ate that along with some fruit and a few bites of kale salad (I pushed this last part on them). My 12-inch skillet was getting lots of attention and my 10-inch was sad, so I decided to bake a GIANT chocolate chip cookie in it! Bring on the sugar folks! Please don’t criticize me, it’s been raining cats and dogs all week and my kids came home with amazing report cards, so they deserved this Friday treat, right? 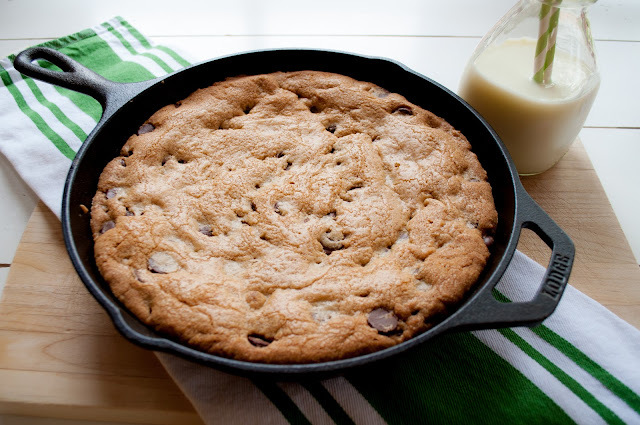 Have you picked up a cast iron skillet yet? If so, have you ever made a cookie in it? I didn’t until today, and I am so glad I did as this cookie was YUMMY and super easy to make. 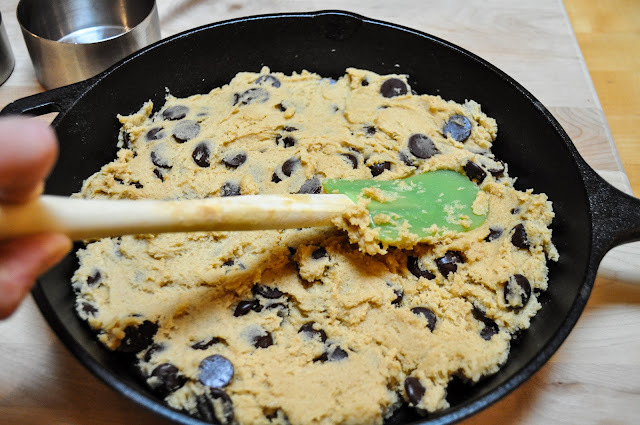 Way easier in fact than baking up a bunch of cookies. 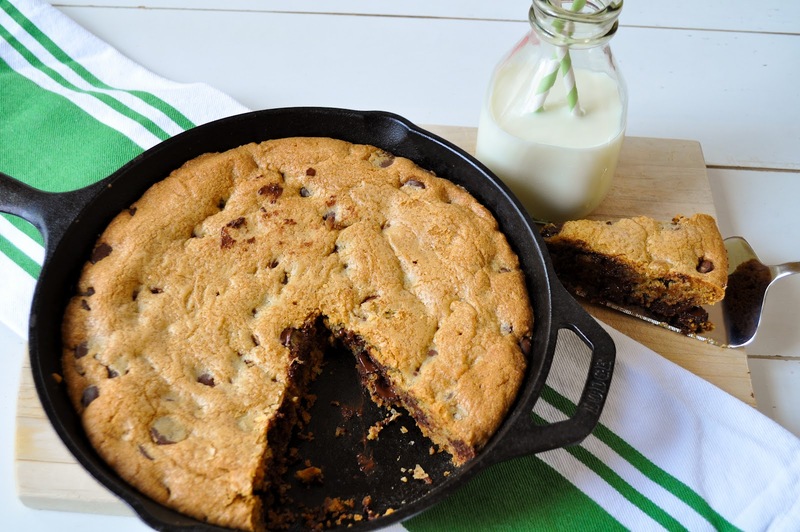 This is the way to go folks if you want a quick and easy dessert. It could even be a great birthday cake. Just throw some candles on top and singHappy Birthday! 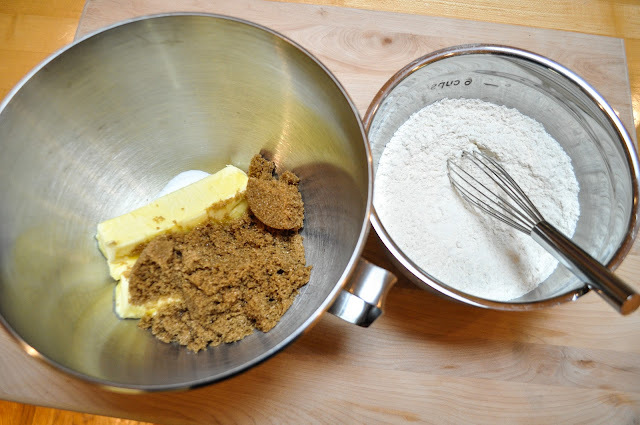 In a medium bowl, whisk together 2 cups flour, 1 teaspoon baking soda & 1/2 teaspoon salt; set aside. 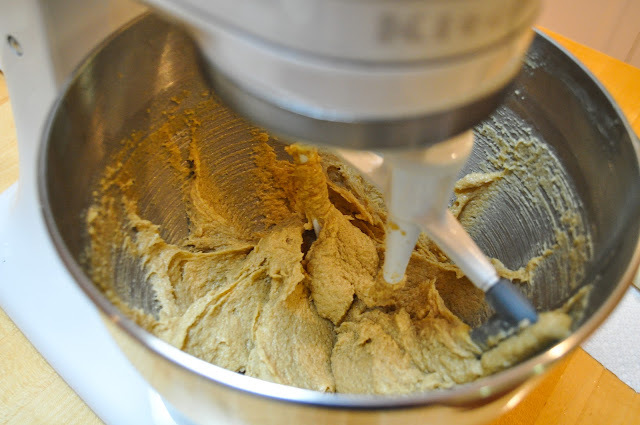 In the bowl of an electric mixer fitted with the paddle attachment, cream the 1 1/2 sticks of butter, 1/2 cup sugar & 3/4 cup brown sugar until mixture is light and fluffy. Add the egg and the 2 teaspoons of vanilla; mix until they are fully incorporated. Slowly add flour mixture, and beat until just combined. 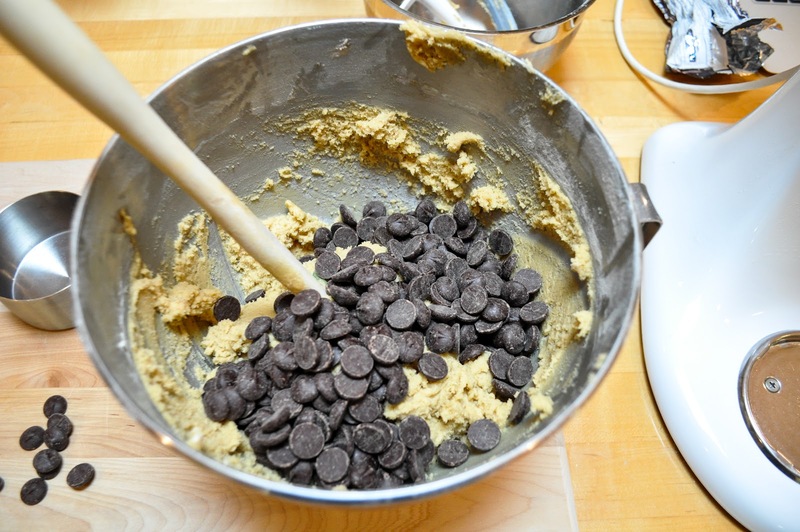 Stir in the chocolate chips with a spatula. A note about chocolate chips, my family prefers dark chocolate to milk chocolate, so we use these Ghirardelli 60% cacao chips. They are amazing, and they do say that dark chocolate is good for you, so that may help take some of the guilt away. Try them in your next recipe that calls for chocolate chips. 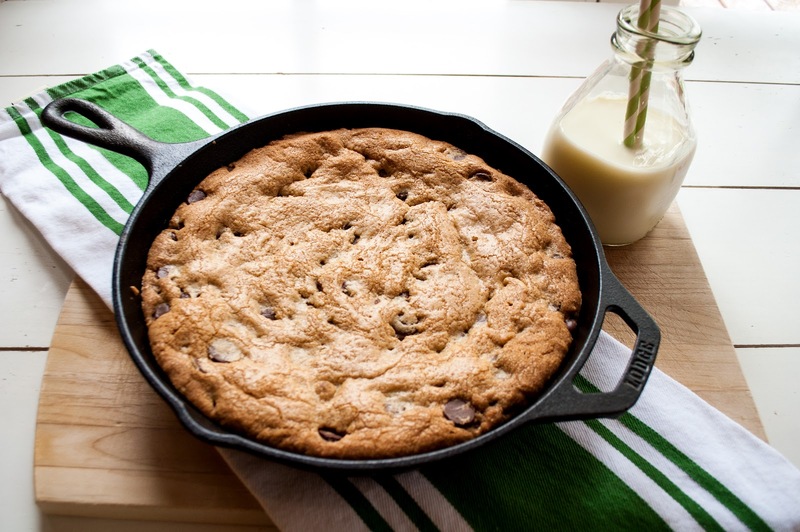 Transfer the dough to a 10-inch cast-iron or ovenproof skillet (if you don’t have a cast iron skillet, then you can use a pie dish). 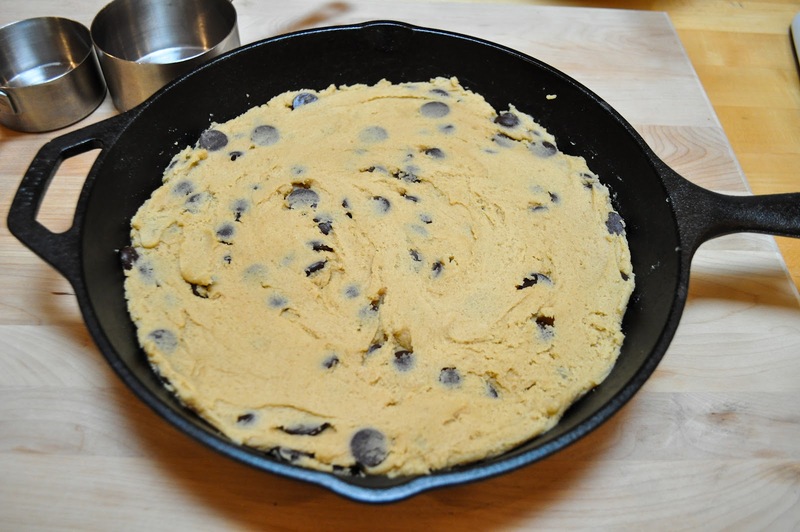 Press the dough down with a spatula to flatten, covering the bottom of pan. Bake until edges are brown and top is golden, 40-45 minutes. My cookie took 40 minutes to bake to perfection. Don’t over bake, as it will continue to cook a few minutes out of the oven. Transfer to a wire rack or oven top to cool, 15-20 minutes. Cut into wedges and enjoy with a glass of milk or top it with a scoop of vanilla ice cream! As you can see, the kids and their friends got to the cookie and were all part of the clean plate club. This cookie went fast, but we did have leftovers. To keep those leftovers tasting out of the oven fresh, I re-heated individual slices in the microwave for about 12 seconds. The cookies got warm and the chocolate chips were all melted again. 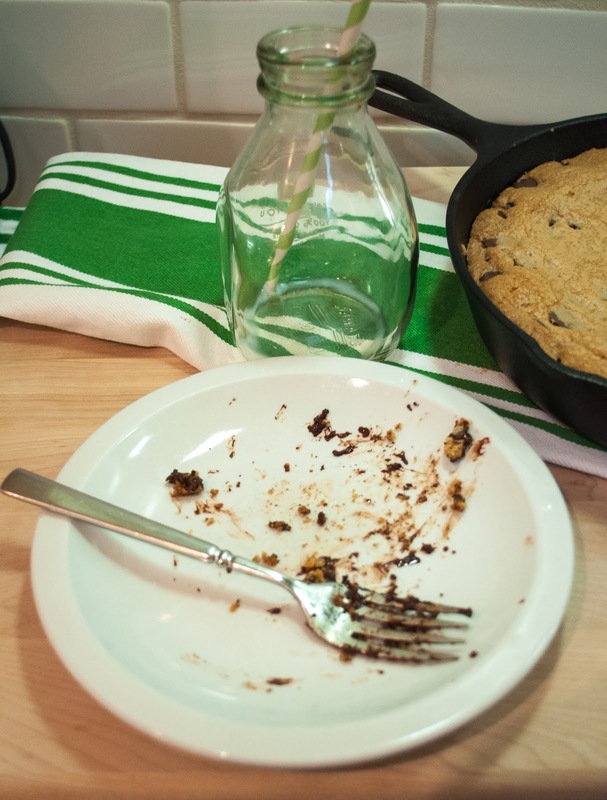 Make sure you wrap your leftovers up tightly as big cookies can tend to dry quickly. What is the most exciting or favorite thing you have cooked in your cast iron skillet? YUM!!! Found your blog via Marty (we went to college together) and am loving it. Made this on a whim for a BBQ last night, and served it with homemade ice cream and my mom’s hot fudge sauce. It was a hit! Super easy, and I love using my cast iron for anything and everything. I was worried the cookie might stick, as I followed the recipe exactly and didn’t put any additional butter or anything in the pan. 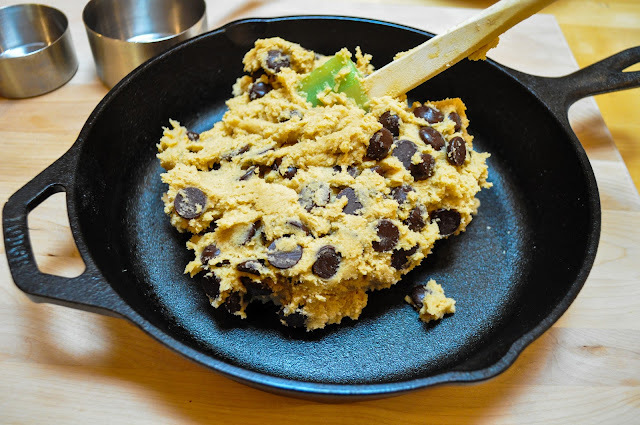 Cookies came out with no problem, and the skillet-baking was great for crowd appeal, ha! Thank you! Looking forward to trying more recipes here! Hi Kyla! SO happy you found the blog and thank you so much for taking the time to comment and let me know how the cookie turned out for you. It’s funny because I made this cookie last week as well. It’s just so good and so darn easy and your right, it does have great crowd appeal. I have served it with a big scoop of ice-cream in the middle but have not tried the hot fudge approach yet, so that’s on my list for next time. It would be so decadent. The skillet continues to amaze me as well. I have had nothing stick to it and have only had it under a year, so it’s not like its super seasoned. If you ever want to deodorize your skillet, just heat the empty pan (dry pan) over a medium flame on the stovetop for 15 minutes or you can heat it in a 400-degree oven for 10 minutes. This method will take any lingering smell out of your skillet. OMG this just put a giant smile on my face. WOW! Such a great idea…. and it has never crossed my mind. Thanks for sharing! I so want this in my life! BTW, saw it on FoodGawker…congrats 🙂 LOOKS so good! Oh my! This would be a huge hit in my house! YUM!!! Ive seen these across the blog world a bit and they have always called my name ( I think we have very similar taste in food my lady!). 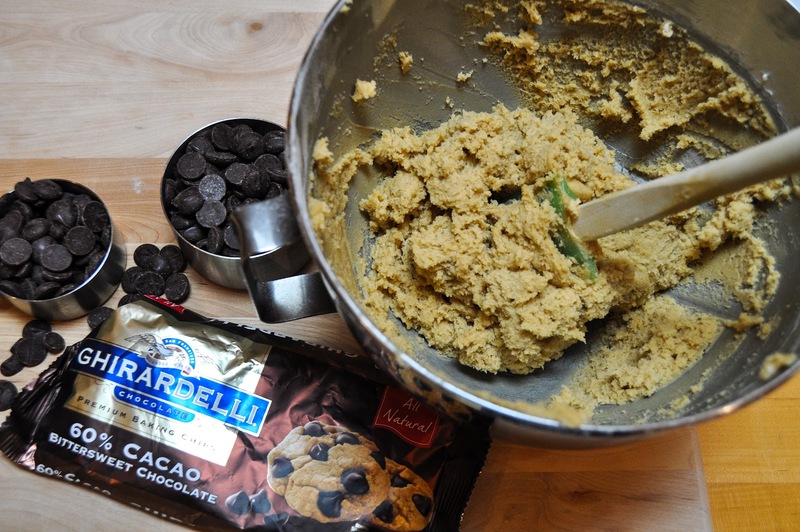 SO delish looking – plus – choc chip cookies you dont have to worry about spreading?? Yes please!!! Yay for good report cards as well. My parents used to take me to dog shows when I got good report cards. I was basically such a dog obsessed dork. You are like Zoe, she is dog obsessed and I wold not call that dorky at all. I call it awesome! She has loved dogs since she was 2. John is allergic so when we need dog fix we babysit our friends “hypo allergenic” dog, (if there even is such a thing).